Think you’re ready to send your shipping and receiving clerk cover letter off to the hiring manager? 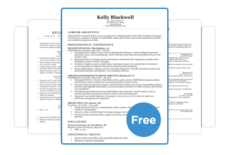 For any job, a flawless and compelling cover letter will increase your chances of getting an interview. Keep reading our guide for tips on exactly how you can achieve that. New to writing one altogether? We have a complete guide to cover letter writing that’s perfect for beginners or those who need a refresher. We have many more examples and guides for reference if you’re looking for a career in other industries. My name is (YOUR NAME) and I want to express interest in the job opening for shipping and receiving clerks at (COMPANY NAME). In my current position, I supervise all shipping and receiving operations for RM Global based in Houston, TX. Although I am in a management position now, working for your company has been a long aspiration of mine. (COMPANY NAME) is known for being efficient in shipping its products in an exceptionally timely manner, and I would love to contribute to the team responsible for its great reputation. (COMPANY NAME) is one of the world’s most influential technology companies, and as a user of your products, it would be a great experience to work here. In addition, I admire (COMPANY NAME)’s dedication to using 100% renewable clean energy in its centers and products. These kinds of environmental initiatives are another main reason why I became interested in your company. I am thrilled at the thought of working at (COMPANY NAME) and I am excited to discuss the job details further. Please contact me at (PHONE) or via email at (EMAIL) if you need any other information regarding my application. I have also attached the contact information of two references that you requested. Thank you for your time and consideration; I look forward to hearing back from you. A cover letter should help, not hurt, your job application. Like a resume, there are certain do’s and don’ts to writing one. This guide will focus on the top three mistakes that are disastrous for your job candidacy, and how you can avoid them. 1. Repeating what’s on the resume. The hiring manager will be reading your resume anyway, so there’s no need to repeat the same information in your cover letter. If you put effort into to composing one that details why you are best for the job, it will make for a much stronger application. Here’s what you can do instead: Take no more than three examples of your work accomplishments to use and expand on them by providing more information about what you achieved. If you’ve won awards, you can give a more detailed explanation of them here. You also can talk about how your work experience helped you gain the skills you need to do the job. Don’t make a dull letter – rephrase your wording to make a more interesting read for the hiring manager. The first half of the sentence is taken from the resume, while the second half is new information added. There are a couple of angles you can take when writing, such as a short story about how you became interested in the company or a challenge you overcame at work. 2. Using the same cover letter for each application. Applying to more than one company? You’ll definitely need to customize your letter. Remember to change the company name and contact information in your header. If you address the hiring manager with the wrong name, it’s a surefire way to get your application rejected. Using a template is fine, but if you don’t change it up, the hiring manager will notice. Here’s what you can do instead: You can start with a template, but always tailor it to the job you’re applying for. It helps to do research about the company and use the information you found in the letter. If you want to impress the hiring manager even more, throw in some facts about the company that drew your attention or makes you excited about potentially working there. Don’t make your letter generic – proper research of the company shows you care about the job. The yellow highlighted sentence is a fact that the candidate found about the company, while the following sentence explains why they are interested in the company. Although it will take more time to do so, tailoring it will be worthwhile in your job search – employers can easily tell when you’re using a “one size fits all” style letter. Hiring managers spend an average of six seconds looking at your resume, so they won’t be spending much longer reading your cover letter. You can get your point across within one page, so don’t write a novel. Here’s what you can do instead: Keep in mind you want it to be easily read, so utilize bullet points to break up text, designating three lines to bullet point examples of work achievements. Create white space in the letter and avoid creating thick blocks of text without any paragraph breaks. Limit the page to four or five succinct, but convincing paragraphs that summarize your work history. Don’t bore your reader! Stick to 4 body paragraphs and one bullet point section. 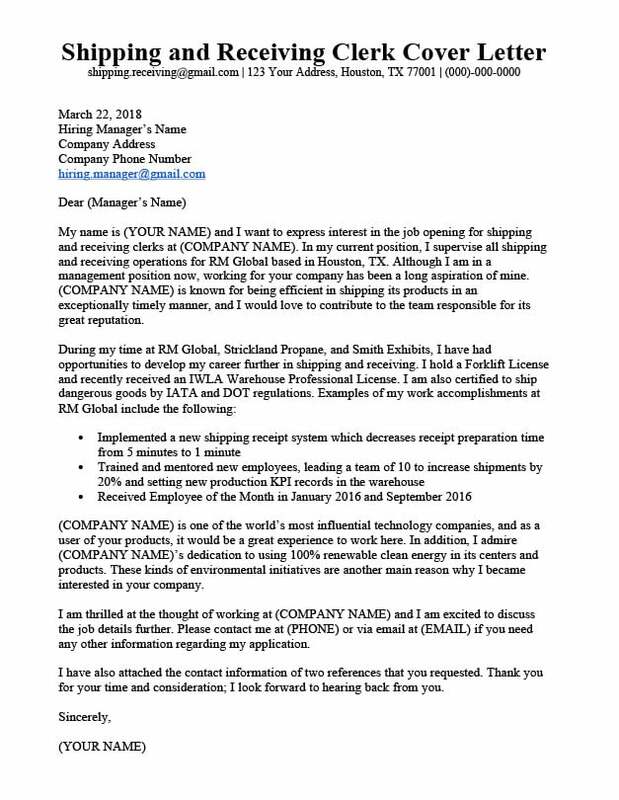 Following the format from our sample, you can create a shipping and receiving clerk cover letter that is easy on the eyes. If you’ve already got an amazing resume, don’t blow off the cover letter – putting your heart into it will improve your chances of getting called for an interview. Using our tips and example above, you should have a better understanding of how you can avoid getting your application rejected. Need to make one quick? We have a customizable builder that will craft yours in minutes.